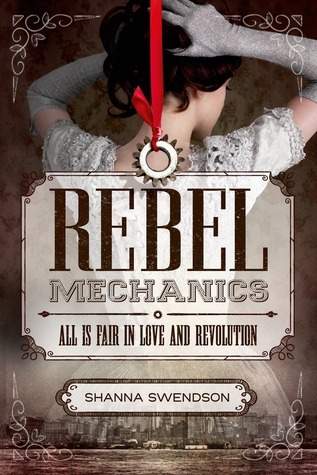 Rebel Mechanics (Rebel Mechanics, #1) is one of those books that appeals to my love of stories about Victorian-era girls who break from societal norms to explore interests outside of tea parties and finding a husband. I’m probably going to wait until I find out how many books are in the series, because I’m just not up for waiting a long time to finish. I can never seem to go back to them once I’ve had to wait for a year or more. Synopsis: It’s 1888, and sixteen-year-old Verity Newton lands a job in New York as a governess to a wealthy leading family—but she quickly learns that the family has big secrets. Magisters have always ruled the colonies, but now an underground society of mechanics and engineers are developing non-magical sources of power via steam engines that they hope will help them gain freedom from British rule. The family Verity works for is magister—but it seems like the children’s young guardian uncle is sympathetic to the rebel cause. As Verity falls for a charming rebel inventor and agrees to become a spy, she also becomes more and more enmeshed in the magister family’s life. She soon realizes she’s uniquely positioned to advance the cause—but to do so, she’ll have to reveal her own dangerous secret. What book did you add to your wishlist this week?